You’re working your way along the trail, forest to your right and left. Raccoon Creek State Park, in far western Pennsylvania. The heat of the day is beginning to be felt this morning. Sun is up, and it’s vaporizing the dew still resting on the billions of leaves around you. It’s the summer, and the heat is becoming a factor. Beads of sweat have got to be forming on your forehead, though they are still bearable, and don’t slow you down. You see her out of the corner of your eye, a slur of comely browns, white, black and, is that cream? Moments pass, as you continue up trail. Then . . . there she is, didn’t wait for introductions, dismissive of personal space, and without concern about your personal situation, and your sense of propriety. Who is the brazen female, who is now upon you, you a total stranger? The USA butterfly most likely to land on you, a Hackberry Emperor, found in wooded habitat, especially where hackberry bushes and trees are to be found. Maine to California, Miami to North Dakota and to Texas, too. Did she choose you for your shmeksy! good looks, your come-and-get-me musky takeaway? Your kindness of heart, good deeds or connection with the Almighty? OK, for your really good choice of field get-up? No, no, no. She’s on you for something else, most likely to score some perspiration salts from the now sweaty neck, or to broadcast her territorial claim to that stretch of trail, or just for the ride. Most don’t understand how fortunate they would be, to travel down the road a bit with you . . . she does. She’s a Hackberry Emperor. Delta Blues? Not on this Trip. This time, it’ll be Delta Browns and greens . . .
We drove nearly 900 miles from Pittsburgh, down to Greenville, Mississippi. It helped that my grade school teachers made the spelling of this beautiful state an absolute must. You had to be able to spell M-I-S-S-I-S-S-I-P-P-I. Greenville was a bustling cotton town, cotton brought to the docks was loaded on ships and sent to all corners of the globe. Although Greenville no longer thrives, the wildlife in the Mississippi delta region was all new to me. Well, almost all new. Asterocampa celtis is also found in Pennsylvania. We have posted several images of our northern hackberrys. 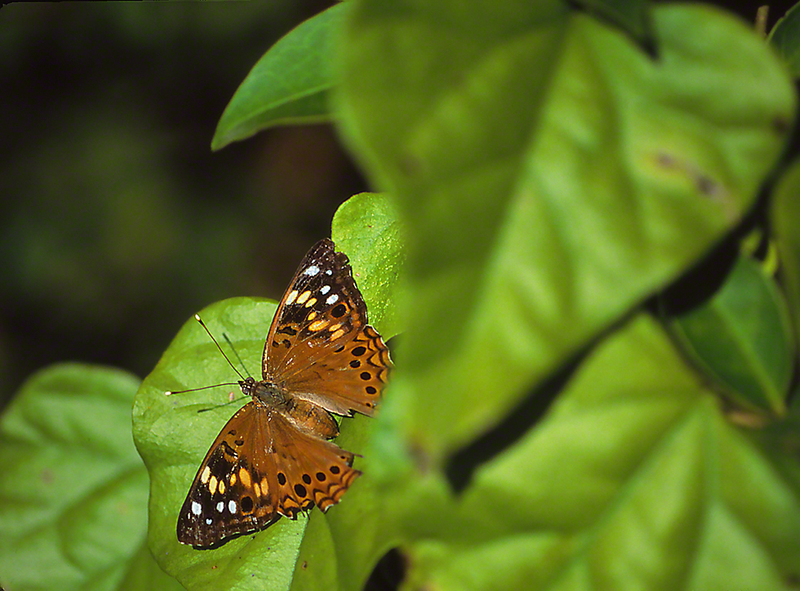 The Hackberry emperors and Tawny emperors (Asterocampa clyton) flying in western Mississippi were impressively rich in color. Their appealing coloration often led to confusion, i.e., was this one here a Hackberry or a Tawny? Leroy Percy State Park offered both hackberrys. Ours here is a Hackberry emperor. Jim Gilreath today posted an exceptional image of a Giant swallowtail butterfly. It was shot in the Butterfly & Blooms Briar Patch in Eatonton, Georgia. The same Briar Patch Habitat that I have visited several times this year. You can see Jim’s photo on the Butterfly & Blooms in the Briar Patch Facebook page. A stunner it is. Certain to catch your eye is the apparent oversize of the Giant’s wings. They look well, too big for the butterfly, too big to control, to coordinate, too big for successful flight. 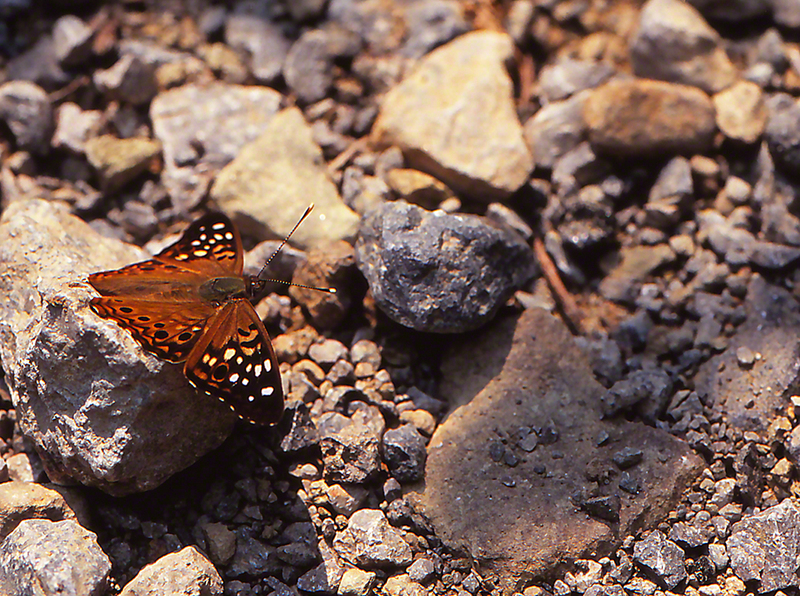 That brought me to remember this image, of a Tawny Emperor butterfly, I happened onto in Raccoon Creek State Park in southwestern Pennsylvania, my home. As I was both marveling at its stately beauty, and shooting away, this angle, that angle, this shutter speed, bracketing that shutter speed . . . I was thinking, Holy Cow! those wings look way too big for this butterfly to fly with. After it tolerated dozens of exposures early, early that morning, it answered my query, when it zoooomed away, in a straight, high speed trajectory, Gone! I think Jim’s Giant swallowtail does have outsized wings, and I think this Tawny emperor’s wings are also oversize. How, with Big, Big wings, do they fly so well, so fast, so directed, so gracefully? Is their extraordinary flight meant as a gift to us, to tease and tantalize our senses? Now, now I can write, Hackberry Emperor in the Briar Patch, back in 2015. An invitation to come and photograph the Butterflies & Blooms in the Briar Patch had come in 2014. My Dad, Jack Zablow, had spent months in 2015 in the Dublin, Georgia VA Hospice. The invite to visit and shoot out the Briar Patch enabled me to see me father (A”H), my brother Stanley, and be almost overwhelmed by the hordes of southern butterflies that visit this Eatonton, Georgia mega-site for the nectar that butterflies love. Four trips to Georgia sadly included the funeral for my father, and his burial at the Glenville, Georgia US Military cemetery, some 1.5 hours northwest of Savannah. He served in WWII, told me that I’d never have to wear the uniform, because They made sure that would not happen again, and enjoyed 100 years of life. The Briar Patch was a great comfort to me. I met new friends, and they are wonderful, talented, good people. Those mornings and afternoons, poised with camera in hand, slide film at the ready, and water, lots of water, yielded superb images, memories. With a 360 degree surround of butterfly beauty, I had the serenity I needed. After 100’s of Gulf frits, Black swallowtails, Tiger swallowtails (many, many black form females), Variegated frits, Cloudywings, Long-tailed skippers, Buckeyes, Monarchs, Giant swallowtails, checkered skipperrs, Carolina satyrs . . . it was a treat to find myself face to face with this Asterocampa celtis. He’s been around the block some, but his forewing spots of white, yellow, black and orange sung out to me.